Image caption Hertfordshire Police said it is treating the deaths of the man and woman as "unexplained"
The bodies of a man and woman have been found in a flat above a parade of shops. 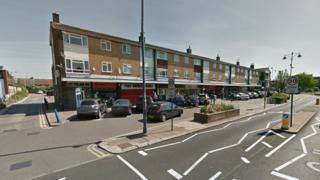 Police and ambulance crews were called to Newnham Parade in Cheshunt, Hertfordshire on Friday. It is believed the man, who was in his 50s, and the woman, who was in her 40s, were known to each other. Hertfordshire Police said they were not looking for anyone in connection with the deaths, which were being treated as "unexplained".